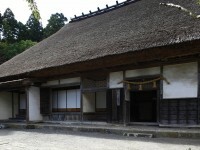 The Oki-ke Traditional Residence served as the residence of the chief priest of the main shrine in the Oki Islands, Tamawakasu-mikoto Shrine. It was built in the unique architectural style to the Oki Islands, Oki-zukuri and has features such as three separate entrances which were used according to the status and purpose of the visitor. Inside the residence, you can see the bullet holes and sword marks left on the central pillar from the Oki Uprising that happened at the end of the Edo Period, a reminder of the tense situation at the time. Also, you can see important cultural properties such as the only remaining "eki-rei" (station bell) and the seal of Oki's granary in the adjacent Treasure Hall.